Rail travel, like air travel, has a certain level of romance for me. Between stepping aboard the Eurostar from London to Paris on my first trip to continental Europe; to the early morning dash (with no sleep!) 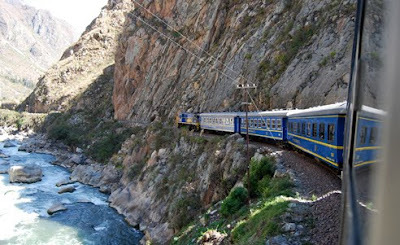 across Budapest to the Keleti pályaudvar (East Railway Station) to catch a train into Vienna for a flight home barely 5 hours later; to the slow ride through the Sacred Valley on PeruRail to Manchu Picchu (pictured above), rail travel has played a large role in some of my most memorable travel experiences! Having taken trains all over Europe, in South America and in Asia, it is therefore ironic that it took me this long to finally step foot aboard an Amtrak service. Amtrak’s Empire Service runs from Niagara Falls on the New York side of the border with Canada all the way down to New York City, making stops in cities such as Buffalo, Syracuse and Albany. I rode on a short segment of this line between Rochester and Schenectady in upstate New York. Arriving at the Rochester Amtrak station (picture of trackside view below), the lack of investment in the rail infrastructure of the United States is clearly evident. 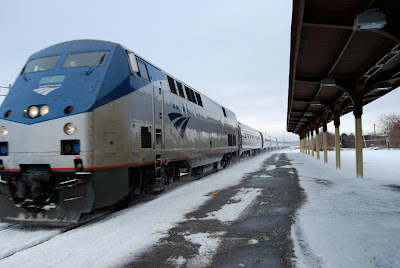 For a city the size of Rochester, NY, with the state’s second largest economy and the third largest population, the small and dark Rochester Amtrak station is more fitting of a suburban commuter rail stop, than the city’s interstate rail gateway. Once onboard, the car and economy seat was comfortable, though clearly older, and less advanced than comparable systems in other developed countries. A half eaten box of food was left on at least one seat (which the conductor cleared after the first stop), and a thick layer of grime can be seen along the window seals. However, I was surprised at the cleanliness of the bathrooms on board. The deli car was open throughout most of my trip, but I did not get a chance to visit it. Unlike my experience with rail travel in Europe, with its to-the-minute punctuality, my Amtrak train departed 17 minutes late, and brought me to my destination almost 30 minutes behind schedule. At one point, we had to stop for almost 10 minutes while a freight train going in the opposite direction passed us on a single line of track. With the expected announcement this month of the Obama administration’s stimulus funding apportionment for High-Speed rail development, I am hopeful some of these shortcomings can be reversed. For starters, build dedicated passenger rail lines so that published schedules can be more reliable. Update stations and cars to bring them up to 21st century standards. If current proposals to update the Empire Service comes to fruition, in the three and a half hours it took me to travel the 210 miles from Rochester to Schenectady, I would have made it all the way to the Plaza and sipping on a martini in New York City.